Jaipur, being the capital city of the state of Rajasthan, has a number of significant grand temples in the region. The famous one includes the Govind Devji Temple situated in the City Palace with which the Jai Singh himself brought the image of Govind Devji from Vrindavan to the temple. Below you can also find a list of temples in Jaipur. This is one of the several great Birla Temples built by the Birla family in India. The Birla temples in different areas are dedicated to different deities including Shiva, Rama, Krishna, and this one is dedicated to Laxmi Narayn. So it is sometimes known as the Laxmi Narayan Temple. Situated at the base of the Moti Dungri Hill, this magnificently built temple was made of white marble. Beautifully carved Hindu gods and goddesses are hosted in the shrine while Hindu mythological events and quotes can be seen everywhere. It is located in the City Palace complex. 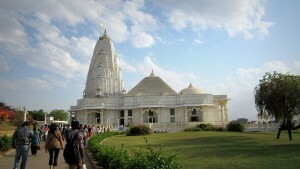 The temple is dedicated to Govind Dev Ji (Lord Krishna). The deity is unveiled seven times a day for Darshan. Famous for its fresh water springs, Galtaji is an ancient Hindu pilgrimage site where at one point, the Saint Galav lived here and practised meditation and did penance. 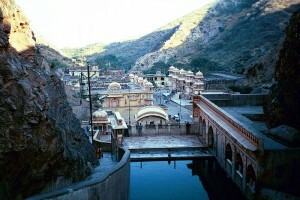 The Galtaji Temple continues to attract thousands of people to come and bathe in the sacred kunds (tanks). Built by Diwan Rao Kriparam in the 18th century, the Galtaji Temple is situated on the Agra-Jaipur highway, 10 kms from Jaipur. It can be easily reached by taxis and buses.